Not content with their recent sell out launch of the highly anticipated Faux Filter Foundation (read more about that one here), Huda Beauty have also just launched more of the good stuff in the shape of 4 Obsessions Eye Shadow Palettes* and 4 Contour and Strobe Lip Sets* for our pre holiday fancy! The Contour and Strobe Lip Sets* come in 4 shades options (encased in a very Insta worthy lip shaped tin no less!) 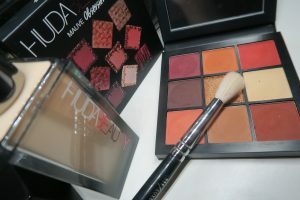 and each contain 3 of Huda’s popular lip products…a Lip Contour Pencil, a Liquid Matte Lipstick and a Strobing Gloss. Perfect Christmas present idea or treat yo’ self…even better! The main thing(s) I’m here to talk about though are the new Obsessions Eyeshadow Palettes*. You know I’m a absolute sucker for a pretty palette, sure you’ll see enough on here if you’ve been around for a while. Huda Beauty already have the OG Textured Shadows Palette Rose Gold Edition* and the more recent follow up Desert Dusk Eyeshadow Palette*…these each contain 18 shadows. 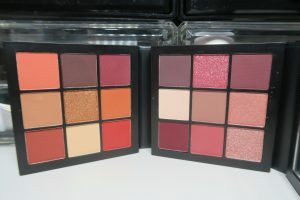 Huda’s shadows are pigment packed and have a smooth blendable formula…I’ve played with both of these palettes and they both have a lot of really pretty shades, but too many in each that I just wouldn’t use or already have similar so have swerved these on purpose and for that very reason! 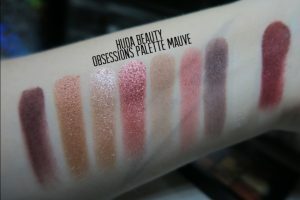 When I saw that Huda Beauty were coming out with the new 9 shade palettes I was pretty excited to see if there was one that would cover my all of my eyeshadow preference bases and there was! Out of the 4 shade options it was the Warm Brown Obsessions* and Mauve Obsessions* that caught my eye and are the 2 I picked up. The other 2 being the Electric* (brights) and Smokey* (what it says on the tin, but a bit too cool toned for me!). You know there was going to be attraction to the warm palette, but I was thinking Mauve would be way cooler/ more lilac toned than it actually is (it’s more berry toned than true mauve in my opinion, which I personally prefer) and it’s different…I think this one might be my favourite of the 2! 9 shadows make them way more petite/ compact and half the size of the 2 earlier palettes (above pic for scale! 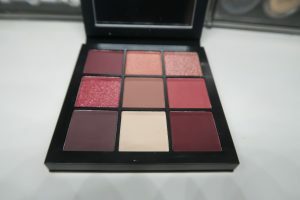 )…Huda’s plan for these was to create a colour theme to suit every taste/ style, something condensed and easy to transport, a more affordable way to try her shadows if not already or update your makeup bag and for each palette (even the bright one) to be wearable and versatile. I was expecting the pans themselves to be a good bit smaller but there’s not much difference…the 18 pan shadow palettes weigh 220g and these guys weigh in at 67g a piece. The packaging is comparable on both sizes of palette, obviously to scale, but all shadows are housed in the signature Huda Beauty cardboard (although the quality is good and they all do feel pretty sturdy!) 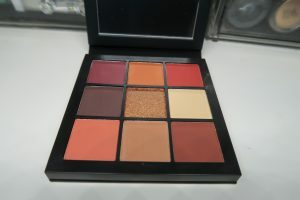 palette with magnetic closure and lightweight but decent mirror. Let’s take a closer look at the Warm Brown Obsessions and Mauve Obsession and their swatches! So the Warm Brown Obsessions*…8 mattes and 1 shimmer in warm tones of brown, orange and red with a gorgeous pop of copper. This one would be great and super flattering on all skin tones and eye colours, especially blue eyes! For the very short time I’ve owned these, I’m really liking them! 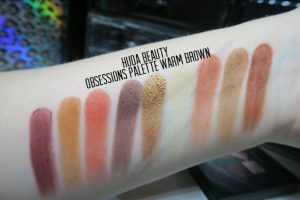 Smooth, blendable and highly pigmented like we’ve all come to expect from Huda shadows at this stage. Across the 2 Obsessions palettes I picked up, there’s not really any of the shades that haven’t swatched well or have cause any issue on the eye. As with any of the other more metallic Huda shades, I feel they apply and adhere a lot more evenly over a glitter glue/ fixing spray or primer and even pressed on with your finger rather than a brush. Saying that for a slightly softer intensity they’ve been going on well with a firmer brush and none of the shades seem to have much of a problem with fall out. I my experience, there can be quite a bit with the metallic/ glitter shades in 2 larger palettes, but not so much with these shimmers. I love how cohesive the Obsessions Palettes are…all colours work really well together and for a relatively small palette there’s pretty much everything you need to create a variety of looks. There’s highlight, transition and darker shades to define in each which is great in terms of travel and not having to carry another palette for things like that if you don’t want to. In my opinion in terms of value for money, retailing for £25/ €28/ $27 each, I think these are great for 9 such pigmented shadows! A little goes a long way with these. 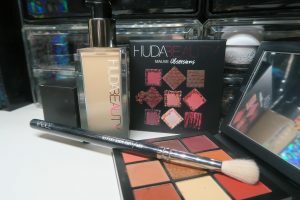 Safe to say I’m a fan of the Huda Beauty Warm Brown Obsessions and Mauve Obsessions Palettes! They’d make a perfect gift for a fellow makeup lover or to yourself from you (I’m all about that life!) but I think if you’ve been wanting to try Huda shadows or wondering if you should get one of the larger palettes, maybe give one of these guys a go first/ instead. Like I mentioned earlier, I really like the warm browns as expected, but check out the Mauve palette if you fancy something wearable but a bit different…I’ll be reaching for this one the most I think! They’re cruelty free and super pretty, what’s not to love! You can get them from Cult Beauty*, Brown Thomas, Selfridges and Sephora NOW! Which one would/ are you going to go for?